Old man Snake returns for battle, this time on the iPhone. Solid Snake blasts his way to iPhone in Konami's Metal Gear Solid Touch. Series creator Hideo Kojima and his crew took the best parts from MGS4 and condensed them into a user friendly and touch screen based shooter. Not only does it allow impatient gamers to get the gist of story without the console version's painfully long cut scenes, but it also gives them the opportunity to take Snake on the go. MGS Touch retells Old Snake's mission to stop Liquid Ocelot at all costs. The game takes you to various locations including the war torn Middle East, South America, Europe and other locales. Along the way, you'll shoot militiamen, members from the B&B Corps and other evildoers while catching up on the various goings on. All told, it's one of the best stories of any iPhone game we've played and well worth your time. You view the action from an over the shoulder perspective. To play, you guide Snake's targeting reticule by dragging it across the screen. Once you lay it over a target, tapping the screen repeatedly orders Snake to fire. While his machine gun comes in handy for killing enemies at close range, you'll need the sniper rifle to nail baddies from a distance. Pinching the screen (as you would a photo or web page) zooms in, and tapping the screen fires the weapon. While targeting soldiers from afar takes patience and a steady hand, there's a wonderful sense of satisfaction that comes from popping some fool in the head. Enemies feature visible weak points, designated by a white circle, and remain motionless for a few seconds before firing; this gives you an opportunity to attack first. When things get crazy, removing your finger from the screen instructs Snake to take cover, where he avoids damage and recovers health. Keep in mind, however, that enemies can destroy cover, leaving Snake vulnerable to gun and missile fire. Keeping with the series' oddball humor, Konami littered the game with toy ducks and frogs. Shooting them gives Snake a temporary rocket launcher or allows him to dodge attacks for a limited time. Each of the game's missions carries an objective. More often than not, you must shoot a specified number of soldiers. While we have no problem with that, most of the missions take little effort to beat, and there's almost no incentive to replay them, outside of besting previous times. As for controls, while they work for the most part, we had difficulty with the reticule. 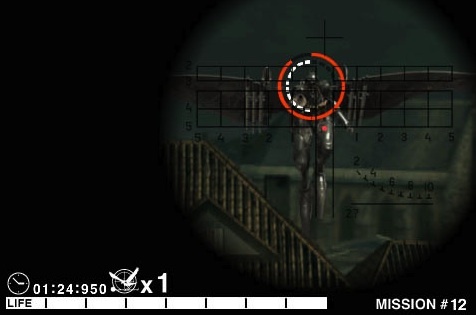 Sometimes we'd line up the target and tap to fire, only to watch as it immediately zipped to the other side of screen. We can only hope that Konami addresses this issue with a future update. Visually, the game's graphics pop with detailed characters, explosive barrels and plenty of attractive scenery, be it a South American jungle or a shelled city. Konami replaced the cut scenes from MGS4 with still frames, but they perfectly capture the essence of the game. Audio junkies will thoroughly enjoy the MGS inspired soundtrack, and the weapon effects are equally polished. Unfortunately, you don't get the famous "Snake...Snake...Snake!?!" when he croaks. 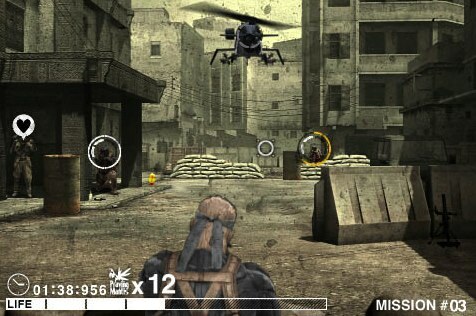 Overall, Metal Gear Solid Touch is a fun arcade style shooter with plenty of action. Whether or not you purchase it, however, depends on your budget. With a hefty $7.99 price tag, Konami's game is more expensive than most iPhone apps, and since it's a bit on the easy side, not worth that kind of cash. Wait for a price drop. What's Hot: Condensed version of MGS4, satisfying sniper controls, familiar characters from the series, frenetic shooting, MGS history section, cool music. What's Not: Cursor sometimes moves off target when we tap the screen, lots of easy missions, costs $7.99.